As far as my dad was concerned my older brother, my dad's first born, was like a prince. In my young mind as I saw things, or how I felt it in my bones, my dad lavished, if not all, an inordinate amount of his time, affections and care towards him, leaving me feeling shortchanged in the bargain. In order to counteract that lavishness and have my dad aim some of that affection in my direction, I did everything I could to gain or establish an equal level of worthiness. The difference was that my older brother received his worthiness, at least as I saw it, with no effort on his part, but I had to continuously prop up mine diligently, making any outcome dubious or short term without my constant input. 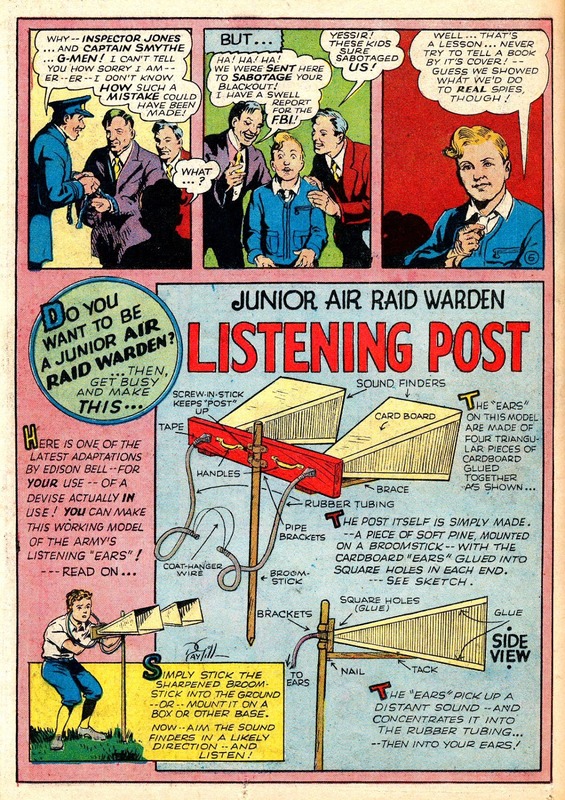 Thus entered into my young childhood me being a Junior Air Raid Warden. 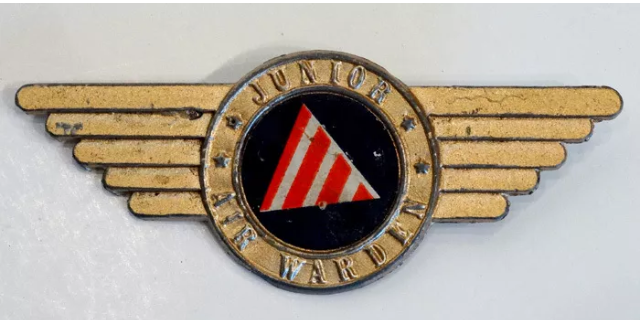 During World War II, on our block and for several around, my dad was an air raid warden, a position he not only relished, but a fine one at that. My older brother didn't care about it one way or the other, but I saw it as a window of opportunity to upgrade my status in my father's eyes. If my solution did or didn't work relative to my dad is nothing I have any real recollection of, however I liked it. 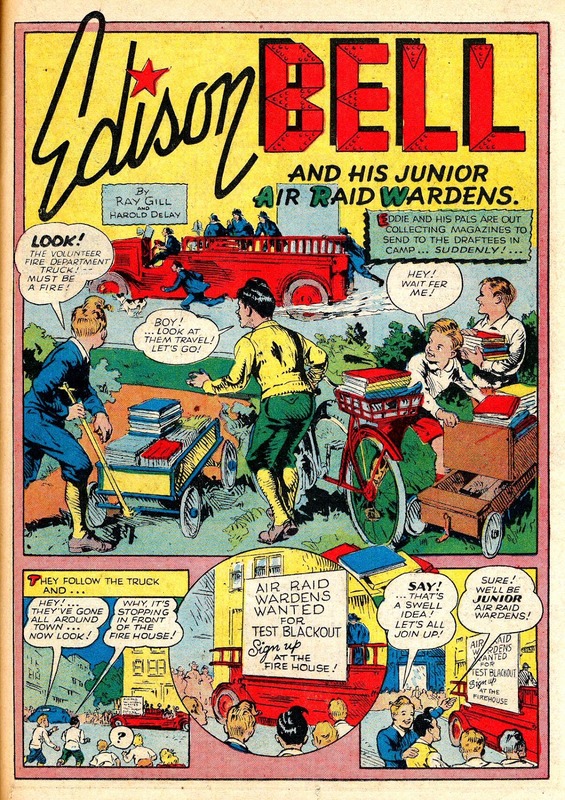 On my own initiative and a little help from my mother, I became a Junior Air Raid Warden primarily on the basis of responding to an ad similar to the one further down the page and reading comic book stories such as Edison Bell's Junior Air Raid Wardens, also below. In the process of doing so, among my peers and adults on the block, I raised my importance beyond any recognition simply from just my dad, making me understand for the first time, sadly though, that there was a much wider world of significance out there. 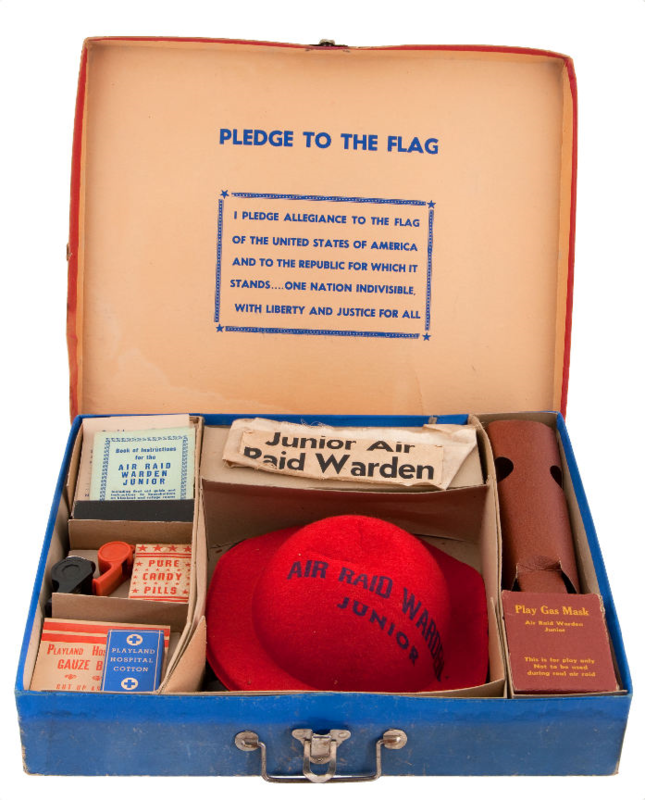 Although we had a few practice air raids and blackouts that my dad had participated in as an air raid warden they were all fairly orderly. The first real one however, was nothing but utter chaos. 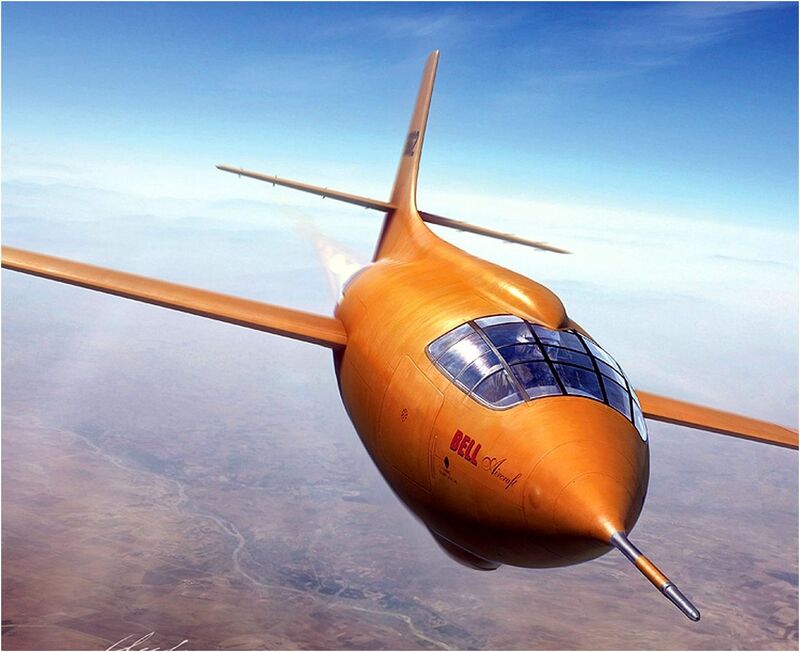 My family and I were living in a then small beach town along the southern California coastline named Redondo Beach, a suburb of and not far from the city of Los Angeles, when on the night of Wednesday, February 25, 1942, a huge, giant airborne object of an unknown nature cruised directly over the top of our house, an object that was easily the size of a Zeppelin. Before reaching Redondo, the giant object had overflown a good portion of the whole of Los Angeles causing nothing but area wide blackouts, anti-aircraft fire all over the city, reeking havoc all up and down the entire L.A. basin --- an object of which I along with my entire family were clearly able to see that night. Guns and sirens and searchlights were all over the place, and even though it was two or three in the morning almost the whole block got up and went outside to see it. "Planes of the Fourth Interceptor Command were, in fact, warming up on the runways waiting for orders to go up and interview the unknown intruders. Why, everybody was asking, were they not ordered to go into action during the 51-minute period between the first air-raid alert at 2:25 AM and the first artillery firing at 3:16?" Anybody who is familiar with or has read any amount of my online works knows that as a kid I was big on box top and the like offers, especially so the radio premium offers such as Ovaltine's Captain Midnight's Radio Premiums and especially so, more specifically in my case, the 1942-1945 Photo Matic Code-O-Graph version that figured so prominently throughout my childhood into adulthood. 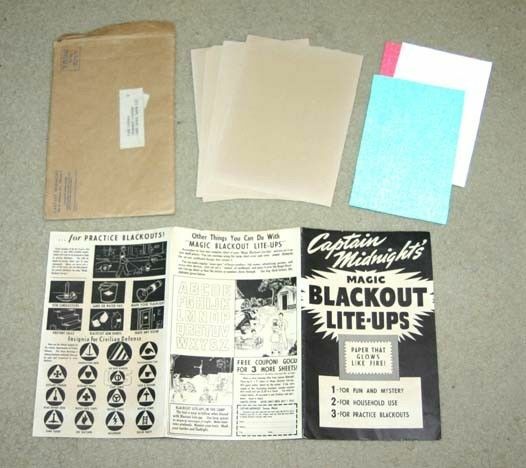 For our purposes here of course, at least as it relates to air raids and blackouts, wasn't a Code-O-Graph at all, but another Captain Midnight radio premium offer called Magic Blackout Lite-Ups. 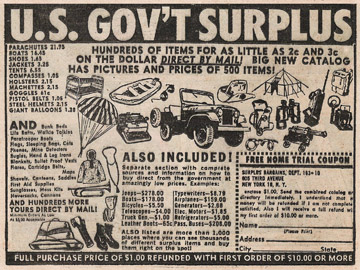 The offer was specifically designed for wartime blackouts, consisting of two sheets of paper impregnated with glow-in-the-dark luminous chemicals. The idea was to glue a small strip of the material at light switches, stair steps, flashlights, etc. so they would be more readily seen during blackouts. 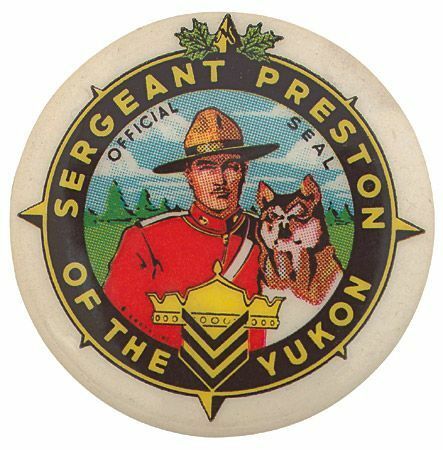 Another box top offer that was really huge for me, and probably the most infamous in the history of box top offers, was Quaker's deed to one inch square of Yukon land offered through the Klondike Big Inch Land Company. I still have my original deed from the Big Inch Land Company. 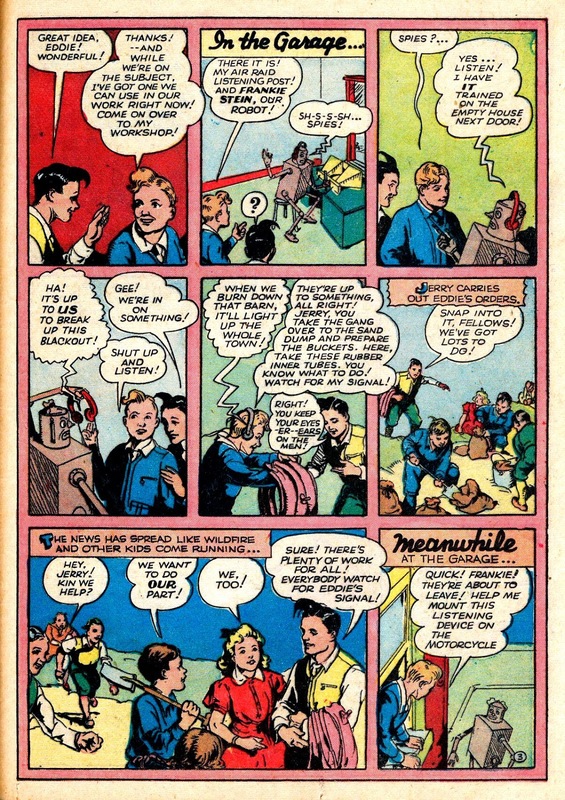 The third box-top offer that was also big in my life was also a Quaker cereal promotion called Capt. Sparks Airplane Pilot Training Cockpit. 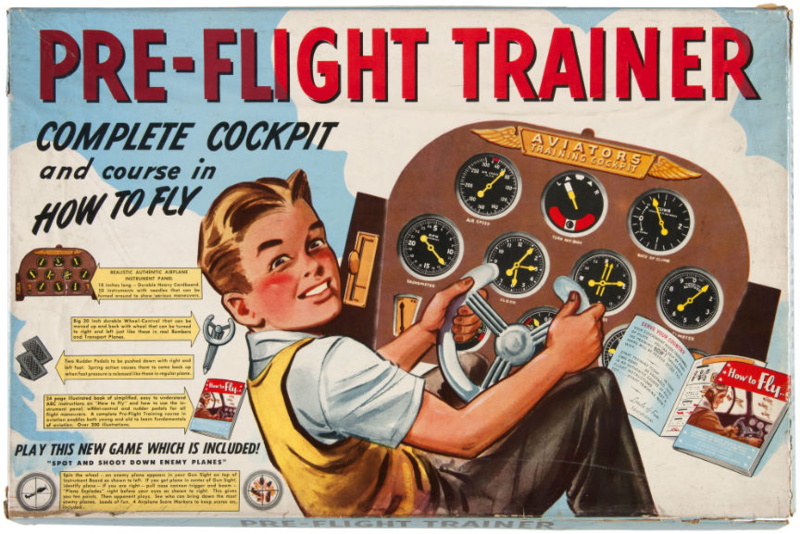 It was from my early childhood during the war years like the Code-O-Graphs but unlike the other offers I didn't actually have one myself, the girl next door who babysat my brothers and me had one and I use to go over there and play with it for hours. "With so much of my life in flux month to month, year to year, the regular listening to Captain Midnight on the radio and decoding secret messages, provided me with a strong, solid continuance and lifeline in an otherwise tumultuous world. People and families seemed to come and go, Captain Midnight seemed to stay." 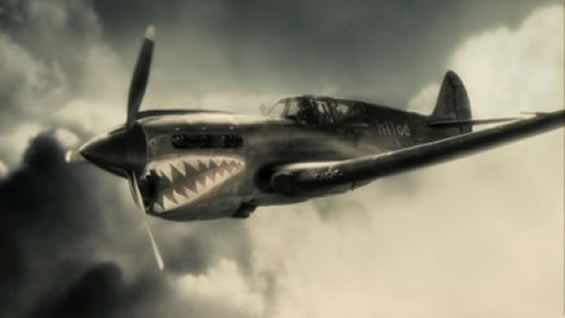 While people like Claire Chennault and his men were waging real life battles against the Japanese in their far-flung air war over China and Burma, facing nothing but superior odds with their P-40 Flying Tigers, and "Vinegar Joe" Stilwell was doing the best he could in the malaria ridden jungles of Southeast Asia with his outnumbered and ill-equipped ground troops against the more powerfully equipped Japanese forces, others back at home in the United States in a groundswell of patriotism, were urging them ever onward with what little they had. 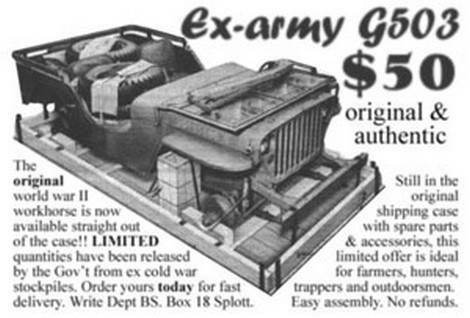 Meanwhile America's war machine was ever increasingly gearing-up, expanding with bottom-line assurances of being delivered expediently and in full strength. 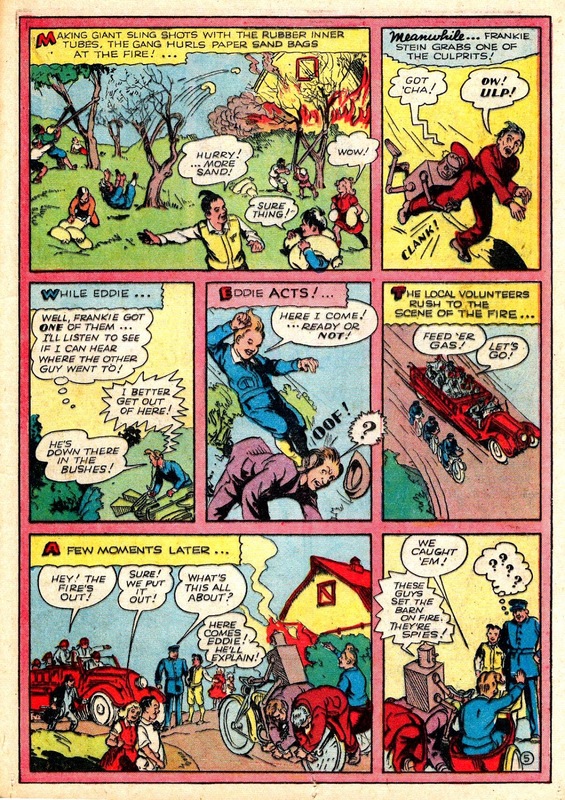 Part of that groundswell of patriotism was being driven at the bottom by other than battlefield combatants, regular people, as well as movie, radio, and comic book heroes all trying to shine a light of hope during an otherwise dismal time. I've cited many examples in my works of the era, and although totally minor in the overall scheme of things, added together they breathed hope with small drip-by-drips into the hearts and minds and souls of many of those at home and abroad. 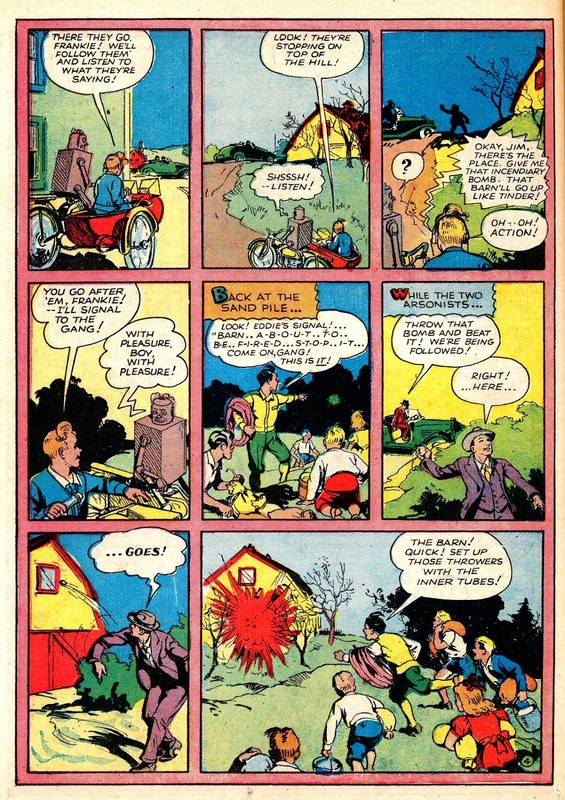 The illustrated contents of this page done in comic book style you are reading right now is just one example of those attempts by people on the home front trying to buoy the spirits of an America caught in tough times. 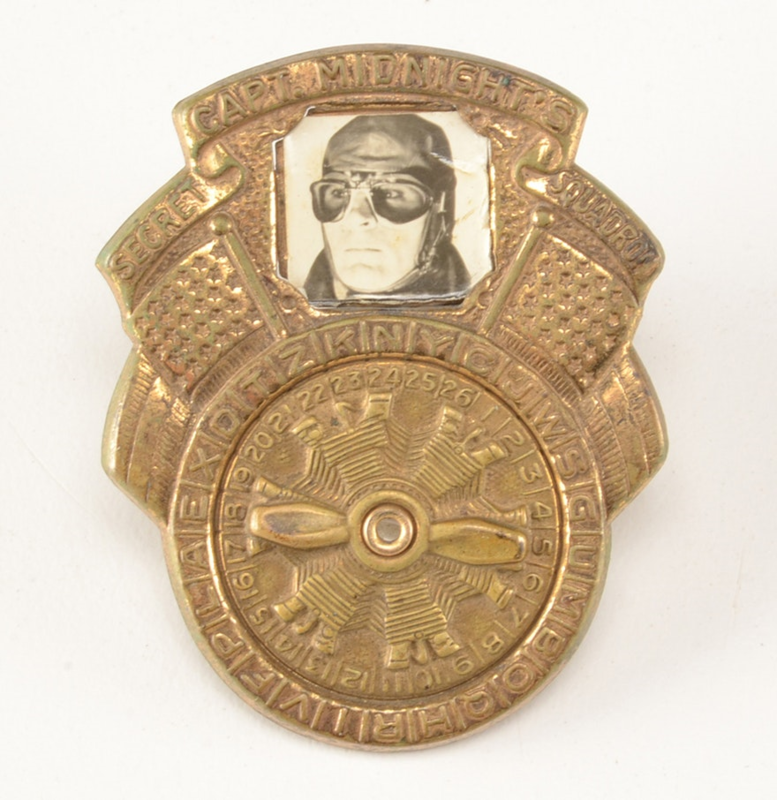 There were of course, many hundreds that could be cited, but two of which I've chosen to exemplify find the heroes, both females, switched from their usual habitat in Europe fighting Germans to fighting Japanese in Asia, more specifically connecting up with the Flying Tigers in the air war over Burma and China. They would be the red haired firebrand and spy Jane Martin, War Nurse and the somewhat more demure, albeit female Army airborne commando, Pat Parker, War Nurse. Because I enjoyed the Capt. Sparks Airplane Pilot Cockpit toy so much, and played with it so often Mary Lou decided to downsize it from our or her use to my use exclusively. She did so by upgrading to a different much more sophisticated model. Where the Capt. 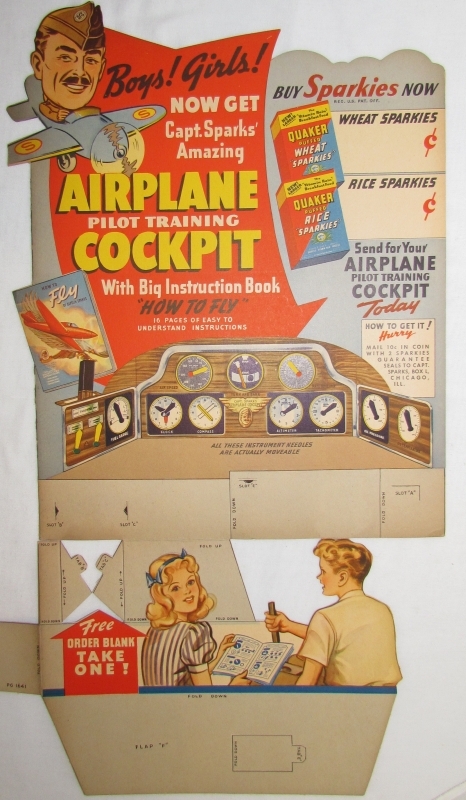 Sparks Pilot Cockpit was a cereal box top offer, and a good one at that, the new one was a big bucks go to the store and buy it model called an Einson-Freeman Pre-Flight Trainer. She didn't actually give me the old Capt. Sparks one per se' after she got the new one, but for all practical purposes it became mine --- although she never allowed me to take it home. I remember specifically the new one because it didn't have a square joystick like the one I played with, but a circular steering wheel. I also remember she didn't allow me to use it much, leaving me relegated to the use of the old one, which I recall was fine by me. Although I didn't actually own the Capt. 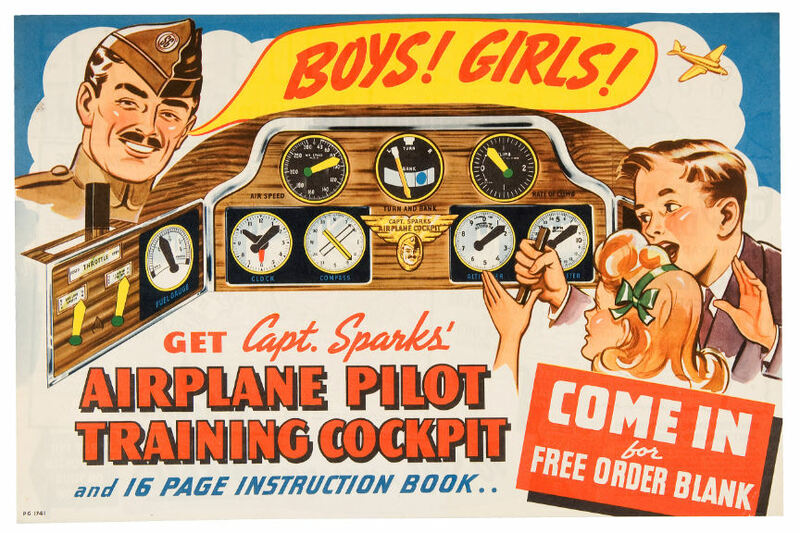 Sparks Airplane Pilot Training Cockpit, the one I write about all the time, Mary Lou's, which was practically mine, did however, play a major role in my later adult life because it justly confirmed what I could or could not remember from my early childhood. 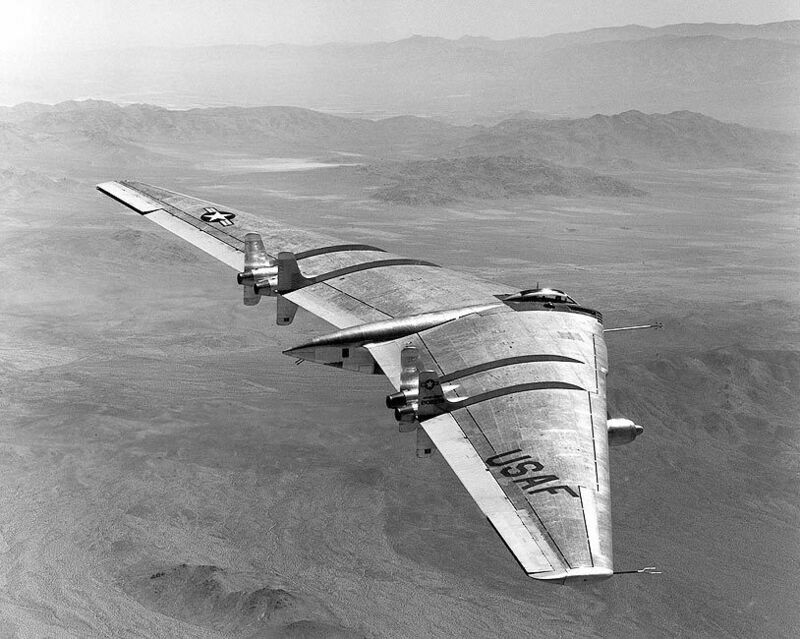 Why what I could or could not remember even comes up is because what I have presented in the previously linked BATTLE OF LOS ANGELES: 1942 UFO. "I remember a lot of things, up to and well before that period of time in my life. For example, my mother nursing my brother who was three years younger than me. Seeing barrage balloons floating in the sky tethered to the ground over the shipyards in Terminal Island where my father worked. 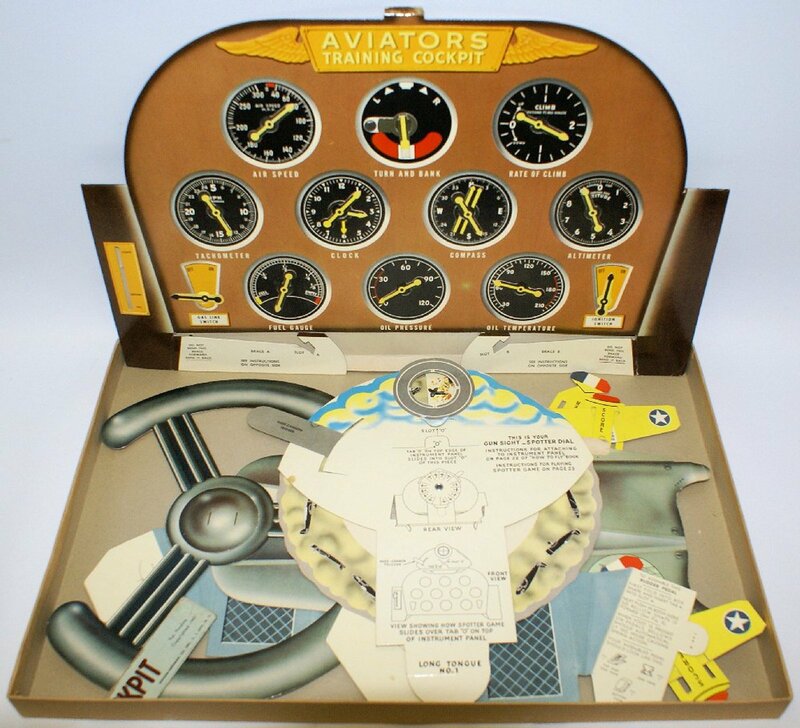 Because metal was not available for toys during wartime, the lifesize cardboard toy fighter plane-type cockpit --- colored on one side with dials and printed only in black and white on the backside --- with a movable square cardboard joystick that the girl next door owned." A half a world away on that exact same Christmas day in 1941 that the Japanese Imperial Submarine I-19 was busy unleashing torpedoes against the unarmed McCormick Steamship Company's 5,695-ton American lumber carrier SS Absaroka in the channel between Catalina Island and the mainland off Point Fermin and practically within sight of the Redondo Beach pier if not in sight, the Japanese launched a massive air attack against the Flying Tigers. Final accounts of the victories varied widely. Officially credited to the A.V.G. were thirteen Japanese bombers and ten fighters, a total of twenty-three planes. Leland Stowe, the American war correspondent who flew to Rangoon immediately after news of the astounding Japanese defeat reached the outside world, reported that the Flying Tigers had brought down at least twenty-eight planes. 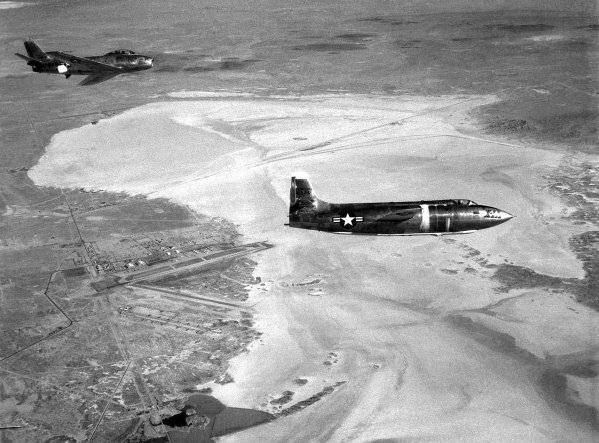 They estimated six additional victories over the Gulf of Martaban, where the Japanese aircraft had sunk without evidence. 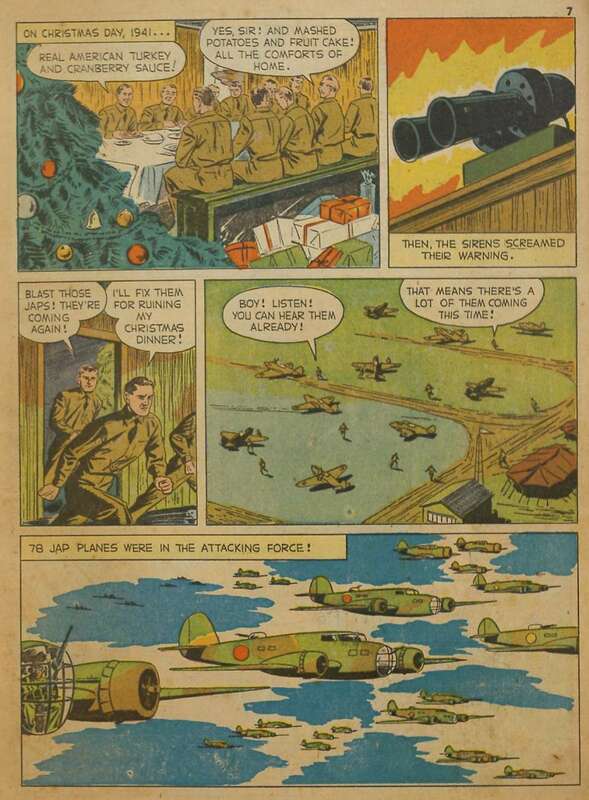 In any case, it was established beyond doubt that of the one hundred and eight Japanese planes participating in the two Christmas Day raids, the Flying Tigers had knocked out at least thirty-six. In addition, the Japanese had lost not less than ninety-two pilots and bomber crewmen, as compared with none for the A.V.G. COL. ROBERT L SCOTT, JR.
As a kid it seems like a large portion of almost everything I learned came from reading comic books. Over and over, even today in the stuff I write I often refer back to something I read at one time or the other in a comic book, that is, except maybe for one major time when there was not just comic books involved, but the coming together of BOTH comic books AND Saturday afternoon matinee movies of the day. 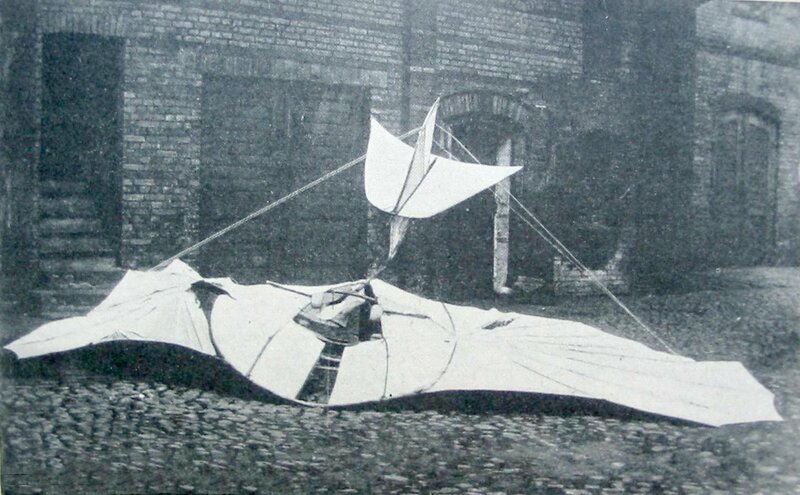 In that particular incident I designed, built, and flew a Da Vinci-like flying machine at a height well over two-stories above street level --- before crashing --- as described in Tarzan and the Huntress. "Halfway across busy Arlington Street the craft began slowing and losing forward momentum. It began dropping altitude rapidly, eventually crashing into the porch and partway through the front windows of the house across the way." 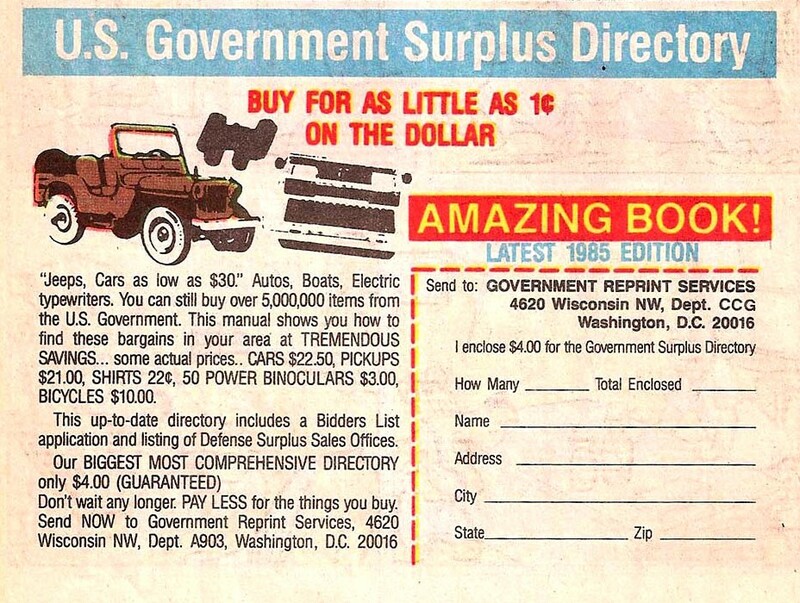 Besides comic books I was also big on box top and the like offers. 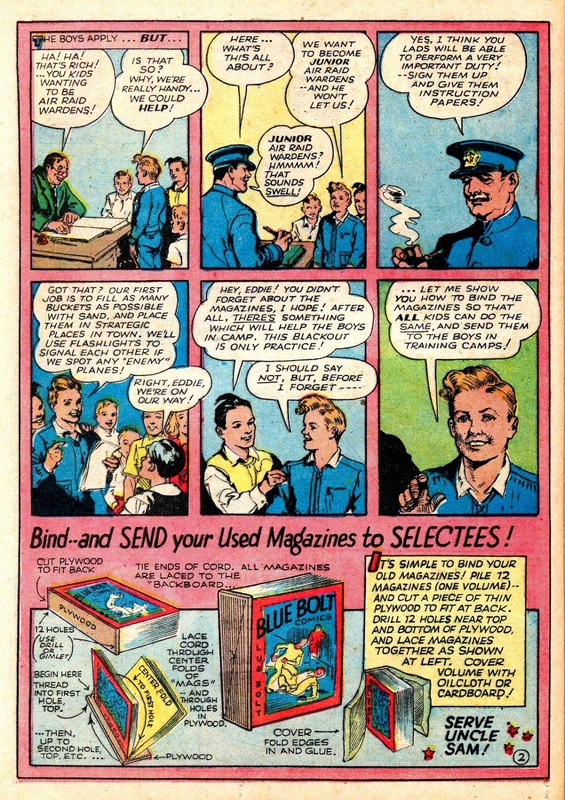 As I viewed it, comic book ads were a quick jump from box top offers, falling into a similar or like category. 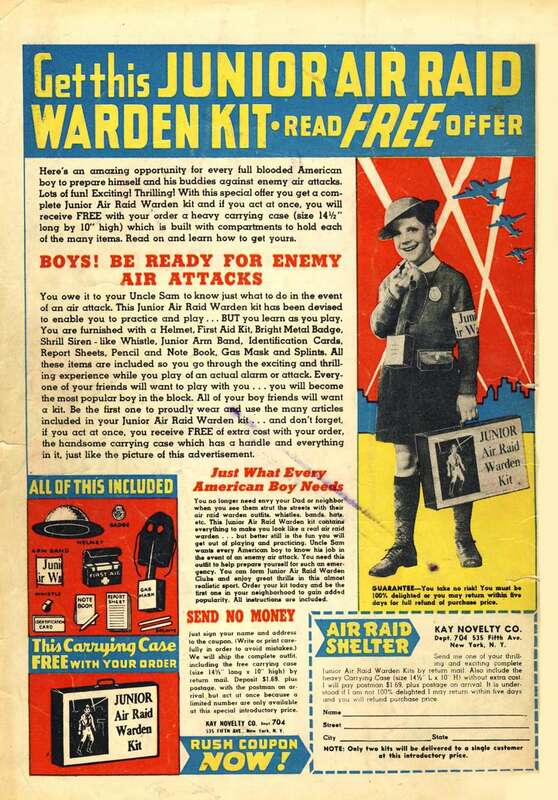 After I answered the comic book ad to become a Junior Air Raid Warden, and at the time I don't think I was even in kindergarten yet, the rest was easy. 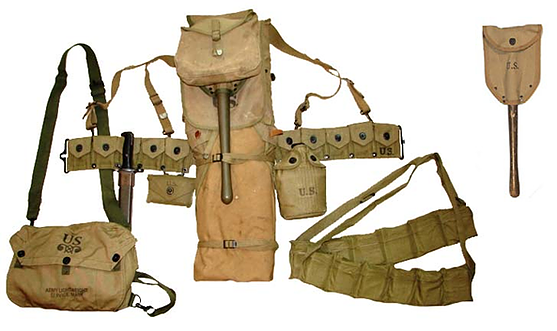 "Traveling in the desert I carried a World War II pistol belt with a G.I. canteen always filled with water, and along with the canteen, a pouch hooked to the pistol belt. I had a couple of those 'Carlisle' first aid pouches and I used to carry all kinds of stuff in them. Stainless steel pocket knife with a fold-out fork and spoon. Compass. Waterproof matches. 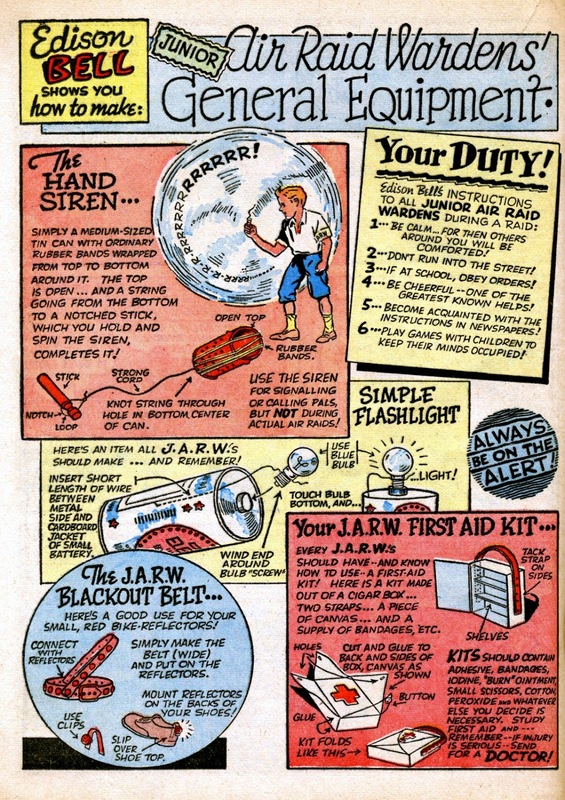 Always in the pouch as well was one of my most prized possessions, a pocket-sized sun dial gizmo called a Little Orphan Annie Miracle Compass Sun-Watch, a one-time radio-premium offer given me by the grandfather of the girl who used to babysit me when I was even a littler kid." 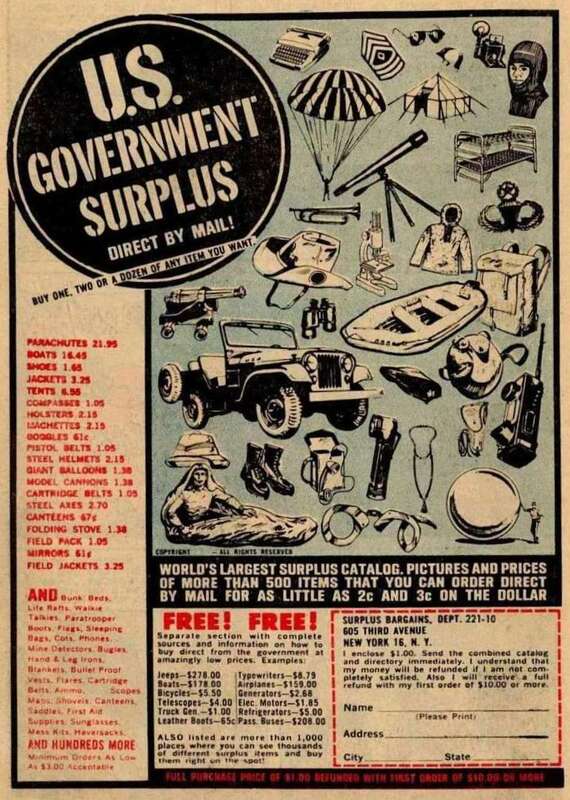 When my uncle returned to Santa Fe and I started living with a foster couple, mail order took up the slack. 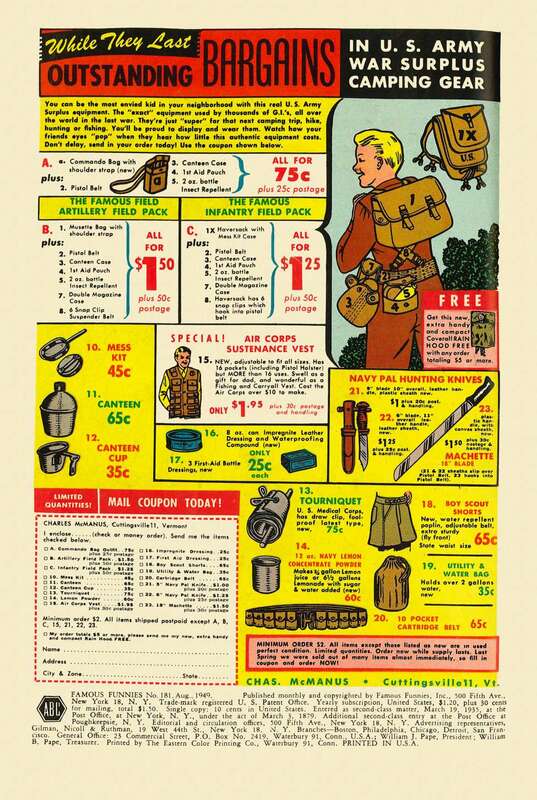 The graphic that follows of a backpack, pistol belt, canteen, a shovel, etc., is just like all the stuff I would order from Army surplus ads that used to show up, like the one below, in comic books of the era. Since I was just a kid with no mother and father and living with a foster couple at that, the question always comes up, "Where did I get the money?" Not being totally truthful about my age, through the influence of my stepmother, I got a job at a place called The Normandie Club. Even before I reached ten years of age my Stepmother, much to my dad's chagrin, bought a ranch in the Mojave Desert. The property was a whole section of land in size, that is, one square mile, with ten or twenty acres set aside on one corner for the ranch house, barn, and horse corrals. No sooner had she bought the ranch than my brothers and I moved there, doing all kinds of ranch stuff like ride horses and shoot guns, of which the ranch house had a number of them --- some on the wall and above the doors such as a lever action 30-30 Winchester, a shotgun or two, a couple of .22 rifles, and a very rare antique 1847 black powder percussion revolver called a Colt Walker which was usually kept in a case. Every once in a while I would take the 4.5 pound Colt out of the case and run around playing cowboys with it, sometimes even mixing genres by wielding the colt in one hand and a Buck Rogers Disintegrator in the other. In that the Colt was a black powder revolver and since nobody knew how to load it and everybody was afraid to, it was never loaded. In my later teenage years the Colt was sent to a gunsmith for some reason or the other and while there the gunsmith let me fire three rounds through it. Almost as quick as we moved onto the ranch than my dad, who along with my stepmother remained living in the city, started to look around at tractors and all kinds of other big time ranch-like stuff. 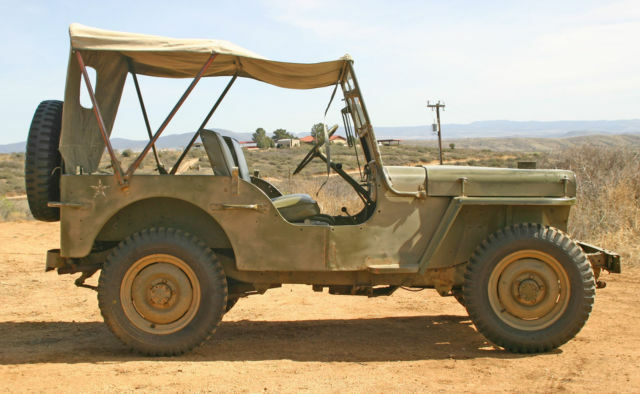 Instead he decided on a four wheel drive World War II jeep to tool around in. 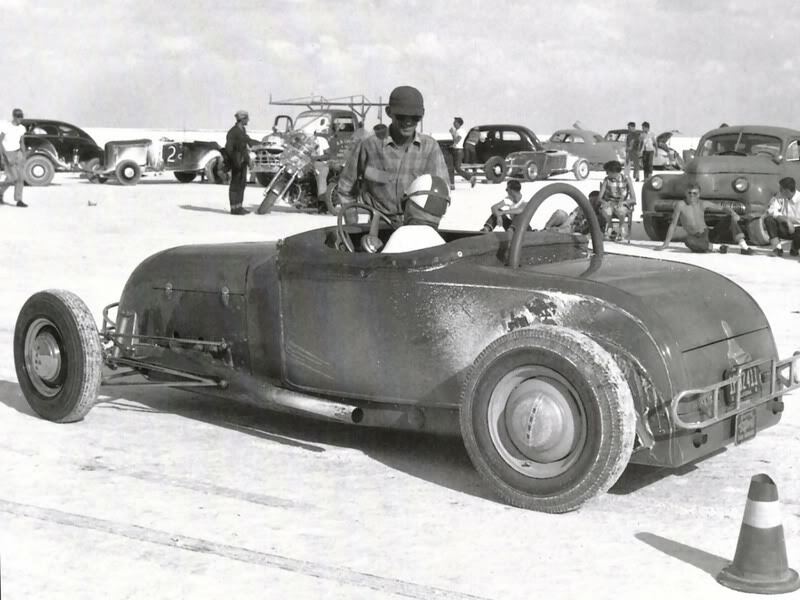 Even though none of us kids were old enough to drive legitimately on any of the paved roads around or near the ranch, on the dirt roads and the scrub brush desert lands surrounding the ranch, as well as on the ranch itself, we drove all over the place.